This week I finally started making another Shimmer quilt . This will be a perfect winter/spring project, and I’m going to take it slow(ish). I’m going to make 4 blocks a month, so by July I’ll have 20 blocks for a throw size. These blocks are really fun to make! I put the Shimmer Pattern on sale (PDF here, Paper copy here), in case you want to sew along with me. I’ll be sharing my blocks in a post in the last week of each month. 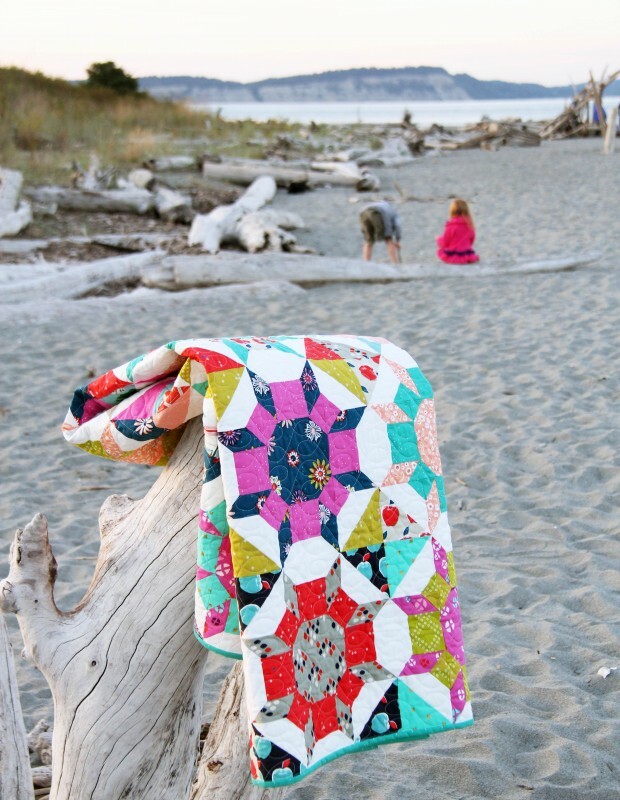 If you are on Instagram, you can add your blocks with the hashtag #shimmerquilt (there are some BEAUTIFUL quilts already there for inspiration!). I cut all of my white/background fabrics at once so it’s out of the way, and I’m going to choose different fabrics each month for my blocks. There is a diagram with each cutting size in the pattern so you can cut what you need for only one block. 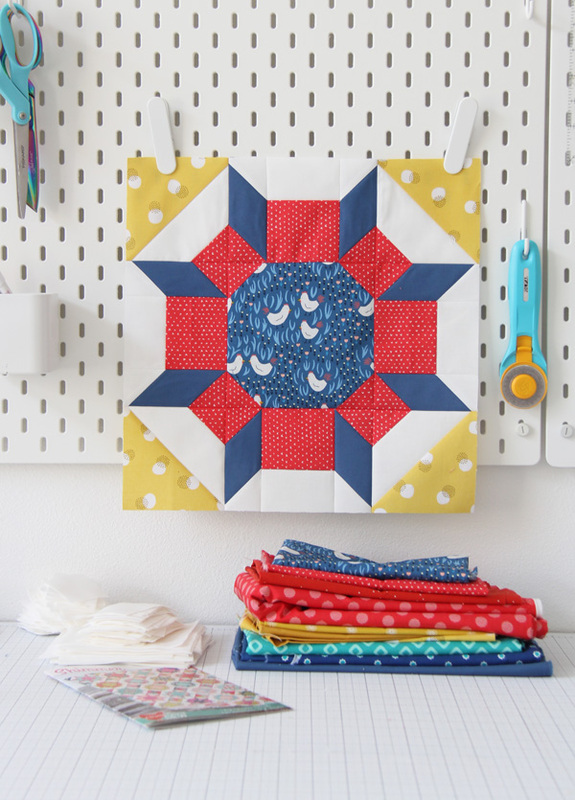 You could make 1 block a week, or whip out 4 blocks in a sewing session…whatever works. Things are pretty low key over here! Just think…by the time you have your blocks done it will be SUMMER again. Time flies by too fast! 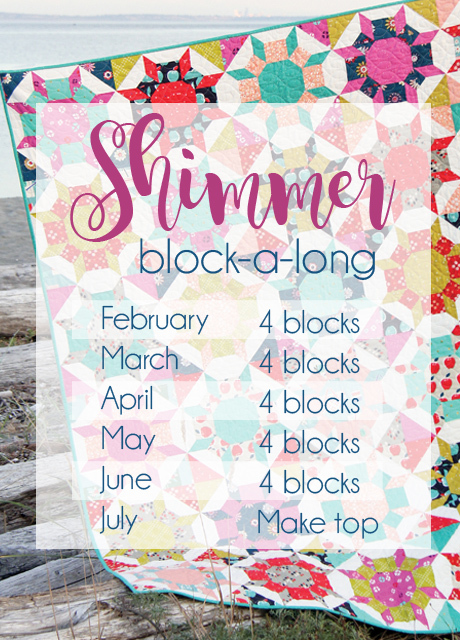 If you want to join me, the Shimmer pattern can be found here on sale, get your background fabric all cut out and ready, and if you need fabric inspiration, visit here! Would a fat quarter bundle and a few yards of background fabric make this? I’m trying to make things from my stash so basing my decision to participate in whether I already have some fabric. Susan, I’m sure FQs would be great, because you’re using such small pieces, in the block. Assuming this is a 12″ block, the corner HSTs are probably 3.5″(plus seam allowance), and the center is 5″(plus s/a), and you’ll be switching fabrics from block to block. I, too, plan to work from stash. Yay! 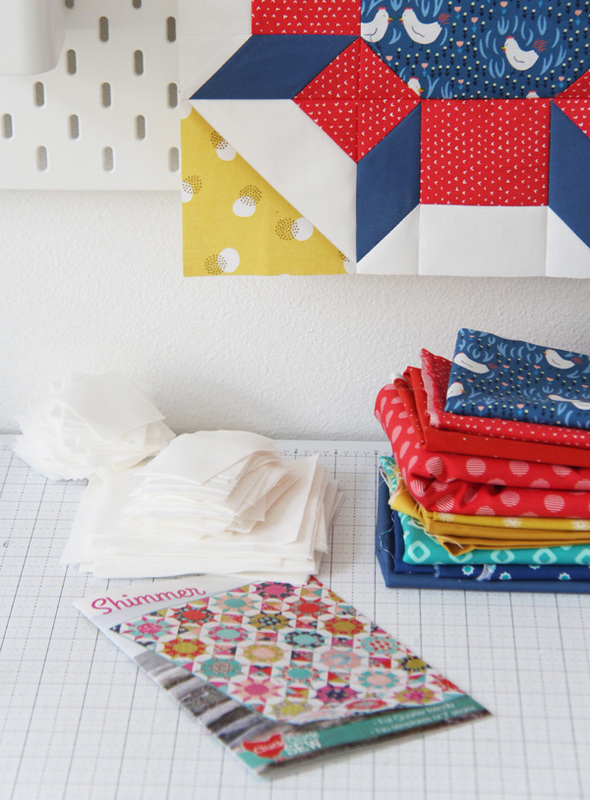 Find any cute fabrics or large scraps and join me! I have a half yard bundle, plus extra, of “hello Jane” that I have been saving!! That will be super cute! Love this pattern, especially with these pretty, bright colors. Thanks for the inspiration! Oh, I’m definitely going to give it a try! I have a bunch of vintage fabrics and this will be perfect for them! I like and appreciate the “slow sew” timeline. Thank you! This will be beautiful in vintage fabrics!!! I’m going to do this for myself since most of the quilts I do are for others or for the nonprofit I belong to that makes and gives quilts away. I do not lack for fabric and may do it with all my hand-dyed fabrics or vintage since I have tons of that including bolts of vintage. Looking forward to doing this quilt. That will be beautiful in Vintage fabrics Jolene! It looks good in really anything! Count me in – already bought pattern – now going fabric shopping in my stash! Just what I need – a low-key QAL. Thank you Allison! Low key is definitely the only way I will do a quilt a long! ;) Glad you are joining in!! If there are a good mix of near solids in the bundle that I would say no, but I like to mix in a lot of near solids and blenders to mix up the busy prints and give the eye somewhere to rest. You could always add in some solids too that coordinate. Allison, I just thought I purchased the pattern through PayPal but I didn’t receive an email. In fact I may have done it twice but still no email. Let me know if you receive anything. I’ll look right now Cindy, but email me cluckclucksew@gmail.com if you don’t get it or hear from me! Excited for this quilt along! Just need to choose my fabrics … am going for the queen size so it’s a good opportunity to sew from my stash. Just ordered the pattern. Excited to see along. I just bought the pattern from your site and I have started cutting my fabrics,all I need now is some inspiration to get started and I think you have just given it to me. Yay I’m so glad you are sewing along with us! I am definitely going to join. I have the pattern already!